It's always nice when Andy's Magic—Children's Entertainer and Magician—gets a local booking. 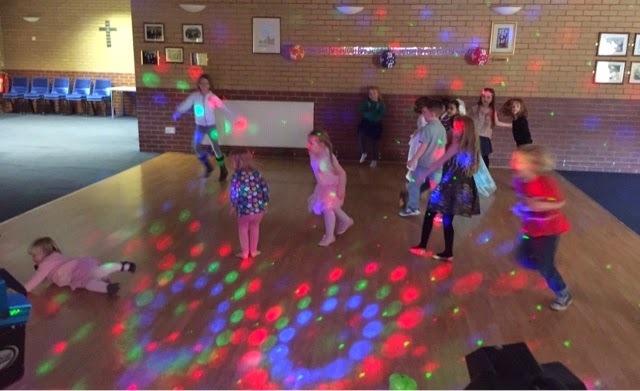 Emily's 6th Birthday party was held at The St Ambrose Church Hall in Kidderminster which is an ideal room for a children's party. 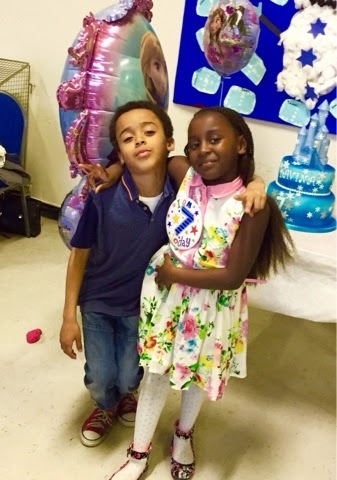 All her friends and family attended and it was great fun from start to finish. Emily and her friends loved dancing in the bubbles to their favourite music from the Disney Animated movie, Frozen. 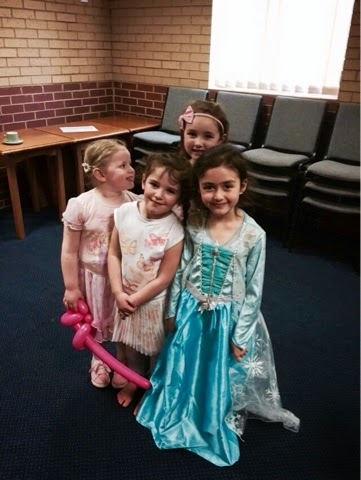 Songs like: 'Let it Go', 'Love is an Open Door' and 'Do you want to Build a Snowman' kept them very happy indeed. After a break for food we all gathered around a fantastic Frozen themed birthday cake and sung 'Happy Birthday' and then Emily blew out all the candles—that actually spelt 'Birthday Girl'—in one go. It was soon time for Andy's Magic Show and during the break many of the children kept running over and telling me how they'd seen me loads of times before and couldn't wait to see the show again. Emily was brilliant as a Magician's assistant. To finish all the kids received a balloon animal each. It was lovely meeting everyone at the party in Kidderminster and special thanks to Albert and his and his family for their hospitality and booking me for this event. I hope to see you all again very soon. Here's the second Saturday Morning Laugh-Out-Loud and features one of Britain's best loved comedy actors. 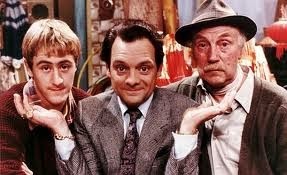 Only Fools and Horses has become one of Britain's favorite situation comedies. Written by the late, great John Sullivan it made house hold names of many of its stars including David Jason and Nicholas Lyndhurst. It also produced some more of the most memorable moments in comedy history including the unforgettable: 'Batman and Robin' scene, remember the hilarious falling though the bar episode - 'Yuppy Love', and who didn't laugh at the classic moment from 'A Touch of Glass' when Granddad, Rodney and Del Boy are attempting to clean some very expensive chandeliers which ends with disastrous consequences. It's true to say that Only Fools and Horses really is comedy gold. 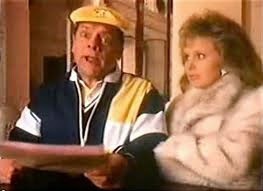 So we all remember David Jason in 'Fools and Horses' but who remembers him playing a very Del-Boy-like character in those Abbey National television adverts which are certainly written in the style of John Sullivan. In both adverts David Jason is joined on screen by Patricia Brake, best known as the daughter of Fletcher in 'Porridge' and 'Going Straight'. And it wasn't only The Abbey National that jumped on the Lovable Rogue / Wheeler Dealer band wagon. Around the same time The Leeds Building Society featured George Cole, complete with an Arthur Daley trilby in their 'Leeds Liquid Gold Adverts'. I'd certainly forgotten these little gems until I spotted them on YouTube. I believe all 'Fools and Horses' fans will love these. I don't know how many were made but here's the two I could find - enjoy them. Writing poetry is hard enough, sonnets are even more difficult but to try and write a sonet where every line is an anagram of the title would seem an impossible task. But that's exactly what David Shulman set about doing in 1936. Shulman, an American lexicographer and cryptographer, succeeded in completing a twelve-line rhyming poem with all twelve lines being an anagram of its title. The sonet, and it's tittle, were inspired and taken from the magical 'Washington Crossing the Delaware' painting (see photo) by Emanuel Gottieb Luetze. 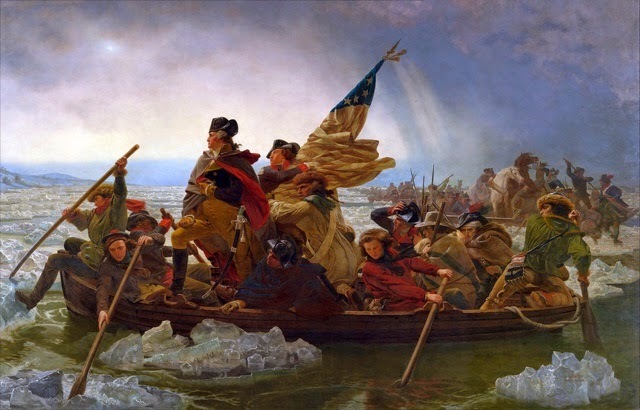 It's an amazing accomplishment, a wonderful intriguing poem and both sonet and painting perfectly commemorates General George Washington's crossing of the Delaware River on those cold nights in December 25th—26th, 1776. Andy's Magic - Children's Entertainer & Magician - Birmingham, Worcester, Dudley, Wolverhampton, Telford, Kidderminster, Stourbridge & all surrounding area's. Apparently, when Xanthe was asked what theme she wanted for her 4th birthday party she immediately replied 'Halloween'. It may sound a bit strange—a Halloween party just a few days before Easter—but it really did work. 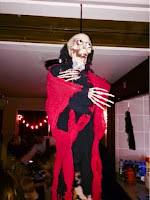 The whole of the Blakedown Parish Rooms were decorated out with Hallowen ghosts, skeletons, pumpkins, cobwebs and lights. And all the children came in their Halloween costumes. It really was a very colourful party. With the room set and all of Xanthe's friends in attendance it was time to get them dancing to songs like 'Ghostbusters' and 'Witch Doctor'. As the bulk of the children were four or younger I always break the dancing with lots of games like 'Pass the Parcel' and 'The Hokey Cokey' is always a sure winner with the younger age groups. 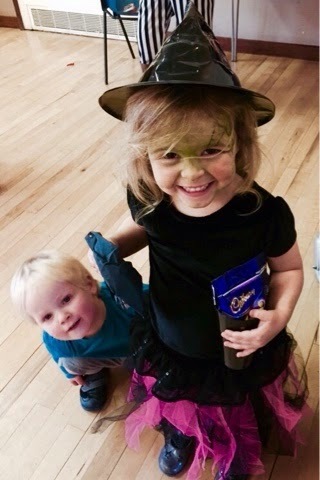 A break was taken for refreshments and the kids were lead into a room that again was very skillfully decorated to the Halloween theme. At the end of the break I got all of the children singing 'Happy Birthday', Xanthe blew out the candles and then it was time for the show. Xanthe couldn't wait to get up and become a magician's assistant in the magic show, she'd seen me before at the nursery she goes to, and was very excited. To finish I made her a balloon monkey in a bananna Tree and then all the children received a balloon animal too. 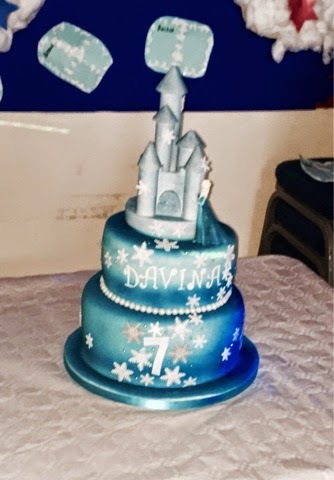 Davina's 7th birthday party, at the Fallings Lane Reform Church Hall in Wolverhampton, saw quiet a few no shows, as far as guests were concerned, but even so it was still a great fun gig to be entertainer and magician at. 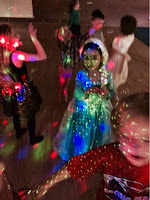 As I set up my sound system I soon discovered just how much the birthday girl loves her music as she very quickly started making requests for he favourate songs—'All About The Bass', 'Uptown Funk' and any One Direction song. The Two hour package, that I was supplying for this party incorporates Andy's Magic Disco and I always feel it's important to keep a have a good selection of current chart music. I'm glad I do, on this ocassion I had all of Davina's requests. I played the songs and she and her friends went crazy dancing and singing along too. In between dancing there were loads of games, prizes and action songs. And, while all this was going on a photographer from Shaddy Media Productions was doing a great job circulating around snapping away taking, what I'm sure will turn out to be, awesome photos that will create magical memories for Devina and her family. After a break for refreshments it was into the magic show and here again all the children joined in fantastically. Davina was delighted with her special balloon creation. To finish all the children received a balloon creation each and went home happy. One lad made me promise to go to his party—I gave a him a business card and told him to get his parents to call me and arrange it - lol. Every Saturday I intend to post a short video clip that should make you Laugh-out-Loud. Starting the weekend with a laugh sounds like a good idea to me. And the first video up comes from Steve Delaney aka Count Arthur Strong. I stumbled across Count Arthur Strong quiet by accident whilst channel hopping trying to find something entertaining to watch—and that's not so easy to do now-a-days. After watching just one episode of this sitcom that revolves around the world of an eccentric, semi-retired musical hall performer—an old duffer who's never quiet made it but thinks he has—I was hooked. Count Arthur is prone to delusions of grandeur, has a very selective memory and suffers from massive doses of malapropism-itis. He confuses everyone he meets and causes chaos wherever he goes, although he is blissfully unaware of any of the problems and frustration he causes. After watching a few episodes I wanted to find out more about Arthur and where this great comedy creation had come from. I was greatly surprised to find that the Count had actually been on the radio for some 8 years or more and as I'm an avid listener of radio comedy the question I had to ask myself, and still ask, is how on earth did I manage to miss this genius of a comedy character for so long? I'm now addicted to both the TV & Radio shows—I can't get enough of that doyen of light entertainment, show business legend, raconteur and after-dinner speaker. Series 1 was screened on BBC2 in 2013 and was just brilliant. Surely there had to be a second series? After a long wait, and plenty of withdrawal symptoms, series two finally aired in January (2015) but this time was transferred to BBC1 and, I'm sure everyone will agree, was even funnier than the first. I can't wait for for the next series. The show is written by Steve Delaney who plays, and created, the Count Arthur Strong character, and top sitcom writer, Graham Linehan, the man responsible for the incredibly successful comedy series Father Ted as well as other comedy hits including The I.T Crowd, Black Books and The Walshes. If you've watched the TV show I'm sure you'll agree it's the funnest comedy to appear on the box for a long time. The first series was nominated for a BAFTA in the 'Best Situation Comedy' Category. As for the radio show, which ran for Seven series (2005—12) and two specials, received The 'Gold Sony Radio Academy Award'—The highest accolade possible in British radio comedy. 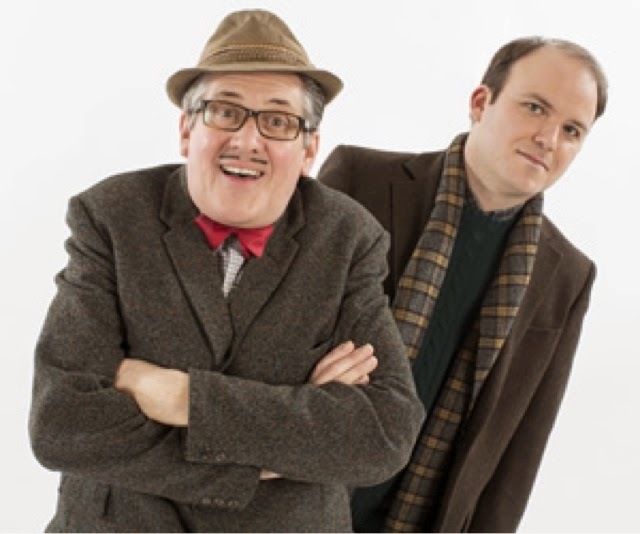 The Count Arthur Strong Tour - NOT TO BE MISSED! Steve Delaney, the man who transforms into this wonderful comic character, is currently on a huge tour around the country—many dates now sold out—and as good as the radio and TV shows are apparently on stage is where Delaney as Count Arthur sits best and one of the funniest shows around. I've got my tickets to see Arthur in the 'Someone up there Licks Me Tour 2015'—I'll write a review when I've Seen it. So here's the first Laugh-out-Loud. This clip comes from one of the funniest episodes from the TV Show, 'The Day the Clocks Went Back'. Here we see Arthur heart broken and confused when the clocks go back. Then he goes for a flying lesson and gets mistaken for the flying instructor. Soon it's terror at 3000ft. It's superbly funny piece, brilliant performed. Watch out for the walk to the airplane—just hilarious. Hope you enjoyed that four minutes of Count Arthur Strong. Next week I'll be talking about that legendary actor ,Wedward Goodwood er, Edward Woodwind, Edward Woodbine, Edward Woodwardward. Oh sod it! The bloke who played The Equalizer. 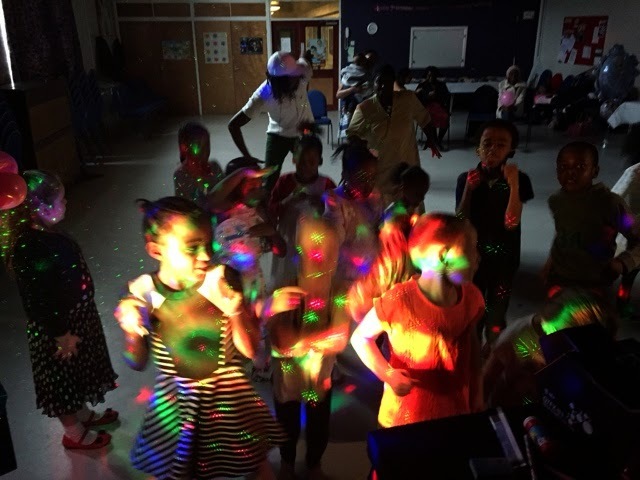 The Oval School in Yardley, Birmingham set their pupils targets to reach, both in attendance and in lessons, and those who achieved these targets were treated to an afternoon of entertainment. That entertainment was supplied by yours truly—Andy's Magic. And I must say it was a great pleasure to return here once again. My last visit was at Christmas and that really was a cracker of a party (pun intended). Having over 60 kids and with ages ranging from 5 to 11 meant that getting the mix of entertainment just right was essential. But even careful thinking about which games to include and what tricks could be suitable might not be enough. Would the older ones be too loud and rough and cause younger ones to shy away from joining in? Or perhaps for the older ones it wouldn't be cool to join in, play games and even dance with younger ones? 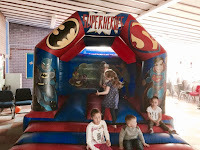 Well, I needn't have worried the children here were fantastic and they all participated superbly, and the older ones actually helped the little ones throughout the whole party. I was booked for the disco with games, prizes, dancing, action songs etc as well as the magic show and, as with the Christmas party, it all went really well—no hitches at all. And it's fair to say these pupils were a credit to The Oval School in Birmingham. All that is left to be said is 'A Big Thank You' the Oval School in Birmingham for booking Andy's Magic—Children's Entertainer and Magician—From this party. The Methodist Church Hall in Kinver, near Kidderminster, was the venue for five-year-old Phoebe's Party. Andy's Magic was supplying the whole Two Hour Party Package. To start with Phoebe was not feeling very well, a little overwrought by the excite of the big day. So while 30 odd of her friends were dancing and having fun in the bubbles, Phoebe was with her Mom. But it didn't take long for her to get into the party mood. And almost as soon as she'd joined in with Pass the Parcel she won a some prizes—Magic! There was no stopping the birthday girl now. In the break we sung 'Happy Birthday' and her Dad brought the cake out and what a beautiful cake it was. From there it was straight into Andy's Amazing Magic Show and Phoebe was a star and could stop laughing the whole way through. To end the party Phoebe received a special balloon creation—a monkey in a banana tree—and all the kids received a balloon animal each to take home. All in all, a great party in Kinver, near Kidderminster. Happy Birthday to Phoebe from Andy's Magic. 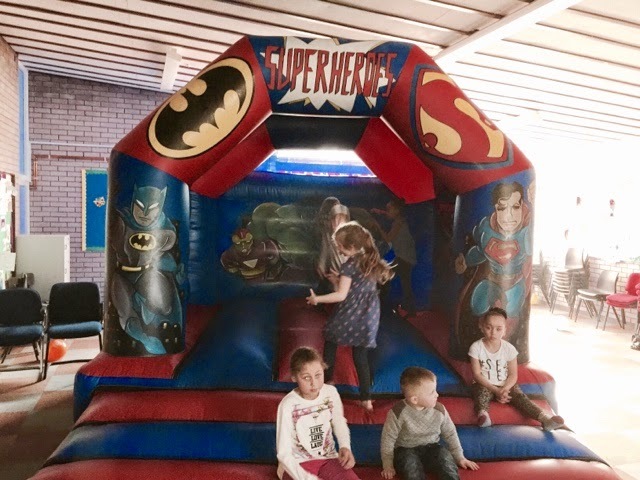 For Izaiah's 6th birthday party, held at the St Mary's Church Hall in Wolverhampton, his mom had already got a friend to put on a small disco and hired a great super hero themed bouncy castle but she wanted something else - just for an hour. It turns out the One Hour Party Package that Andy's Magic offers was an ideal solution. Starting with a musical game, the kids won loads of prizes. After this it was on to Magic show. And there was lots of fun here. Izaiah couldn't wait to help me in the show and asked for a balloon sword. But he didn't just get a sword he was magically transformed into a pirate complete with balloon parrot on his shoulder and great pirates hat too. To finish off all the kids received a balloon animal each to take home. Andy's Magic can offer superb 1 & 2 Hour Party Packages. Why not call on 07976367058 or email Andy now! 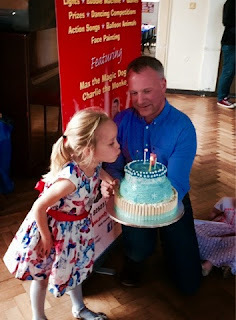 Andy's Magic - Children's Entertainer & Magician - has been booked by The Hansel and Gretel Support Group many times in the past but this was a very special event he attended. "Thank you for your wonderful show at our club On Saturday. You had the children absolutely hooked and so nice to arrive with the music and bubble machine on for the children. You coped well with a very big turnout and we are so grateful to you for making our last club meeting at the Wyre Forest School so enjoyable for the families. 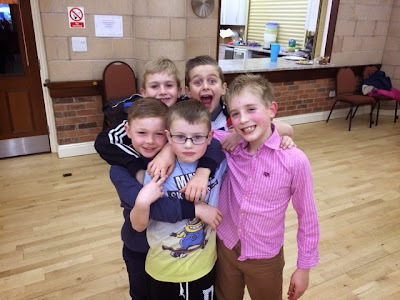 The fish and chip lunch was hugely popular afterwards wrapping up a lovely morning." Who are the Hansel & Gretel support group and what do they do? 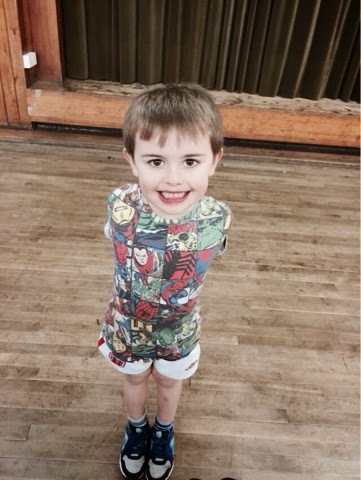 Hansel and Gretel Support Group are a registered charity providing mutual support and friendship to disabled and special needs children and their families in the Wyre Forest area of Worcestershire (Kidderminster, Bewdley, Stourport etc). They are a fantastic group who provide opportunities for families to meet, share ideas, experiences and to build friendships, too. Last month I traveled to the Blackpool for a magical weekend at the Blackpool Magicians Convention. It was, as usual, a superb event with many famous faces to be spoted. Amoungst those I saw and chatted to were: Ken Dodd, Dynamo, Wayne Dobson, Bobby Ball (Cannon and Ball) and Joe Pasquale. Most of these I've seen and met before but this was the the first time I got the chance to see the legendary comedy entertainer Mick Miller perform live. Mick Miller compare for one of the Magic Gala Shows - and the organizers couldn't have chosen better. He was just brilliant, with his witty, fresh, fast and funny one-liners he kept a full house, at the Winter Gardens, laughing right the way through the 3 hour show. I think I could have watched just Mick Miller for three hours, he really was that funny - Magic! He didn't perform his classic 'Noddy Routine' there but below is a live version that I thought I'd share with you and it really is a magical piece of comedy. If you've never seen it before, well, imagine you're listening to the radio and on comes a new episode of children's favorite 'Noddy' but the problem is that the presenter is an alcoholic who hates kids. Sit back watch, listen and laugh with Mick Miller. Happy Birthday to Six-year-old Harrison. 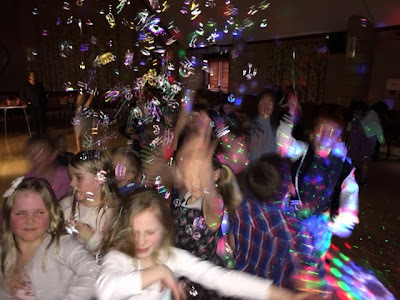 Andy's Magic—Children's Party Entertainer & Magician—was booked for the full Two Hour Party Package which included the disco with a great lights and bubble display (see video taken just before everyone arrives). 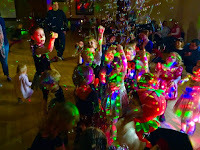 The hall (Trimpley Village Hall near Bewdley) is a smashing venue and just right for a kids party. Harrison was very excited and couldn't wait to help me in the magic show—he was very good, even adding his own funny bits, too. from some of the parents. I hope to see you all again soon. 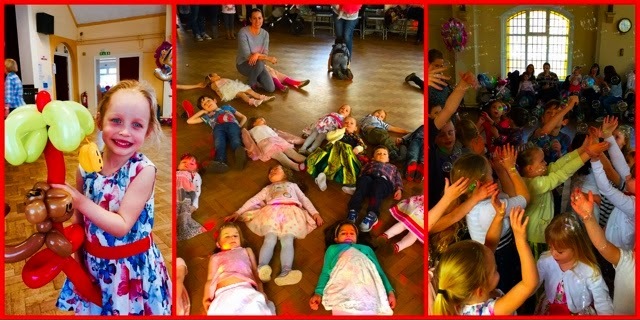 The Avon Croft Art Centre near Bromsgrove offers a nice hall that is ideal for children's parties and it was here that Andy's Magic—Children's Entertainer and Party Magician—was booked to entertain for Arthur's party (see photo). 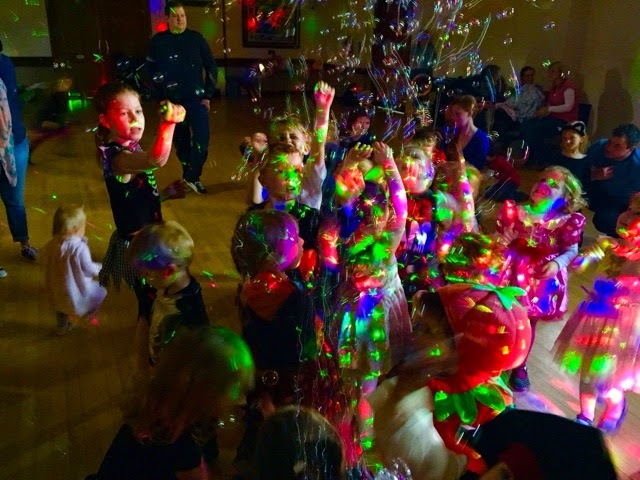 With 30 kids in attendance, joining in with all the fun and dancing in the lights and the bubbles, it's no wonder there was a great magical atmosphere, and Arthur was just fab in Andy's Magic Show, too. Happy Birthday Arthur. I hope to see you all again very soon. Arley Kings Village Hall near Stourport on Severn is a great venue and one that Andy's Magic children's entertainer and party magician frequents a lot. This party for 8 year-old Luke was just great. 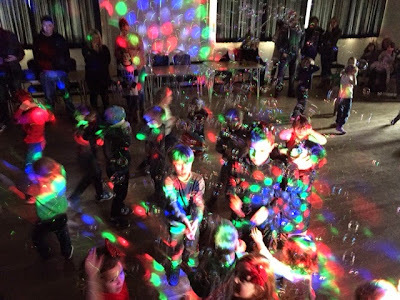 Loads of dancing—the kids loved the lights and the bubbles—magic and games. 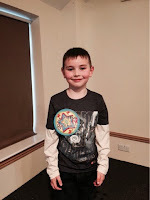 Happy Birthday to 8 year-old Luke. I hope you, your friends and family really enjoyed the party with Andy's Magic.